I woke up this morning around 0630. The air was chilly and crisp. Charlie was curled up in a ball, but unlike our night in Joshua Tree, he didn’t snuggle me. Or stay under his blanket. Water droplets were falling from the trees above me, sounding like a slow drizzle and making me want to stay in my sleeping bag. I was slow to get started, taking my time to just listen to my surroundings while I connected with my family and friends. By the time Charlie was awake (he likes sleeping in too), I was good to go. He had a little case of the shivers, so we headed straight out for a brisk walk around the campground to warm us both up. I wanted to leave my tent up for a bit, in hopes that it would dry off. I used my Jetboil Mini-mo to make some coffee and oatmeal. By comparison, Eric made a feast of breakfast burritos. We joined Eric by the fire again for breakfast and discussed our respective plans for the day. My weather app was calling for a 40% chance of rain until 4pm. If we had been in San Diego, that 40% would have meant a guarantee of rain. Apparently that same 40% only means a slight possibility of rain in Big Bear. The weather held out and made for a beautiful day. I packed up camp and we headed out at 1000, on our way to Heart Rock trail. Today was a good day of doing what I wanted, when I wanted. We made it to Heart Rock trail, but enjoyed a couple unplanned stops on the way. Driving on the windy, mountain roads, I had as much desire to see my surroundings as I did to stay on the road. Other drivers, locals perhaps, were zipping around those curves. I pulled off on turn-outs every time someone was behind me to allow them to zoom along. One of the places I pulled over happened to be the entrance to Heaps Peak Helibase. Now, I’m a lover of all things aviation, but I only expected to find an empty helipad with 360 degree views of the world below. At the top, I parked the car and was headed to check in when I was distracted by those views. With my camera in hand, the intercom came on and I heard “excuse me, ma’am.” I turned around as one of the guys came out of the building, smiling, and said they were just messing with me. He offered a tour of the helibase. Who was I to say no? 😉 The Heaps Peak Helitack crew are US Forest Service firefighters. The helicopter is equipped with a tank that holds over 200 gallons of water! 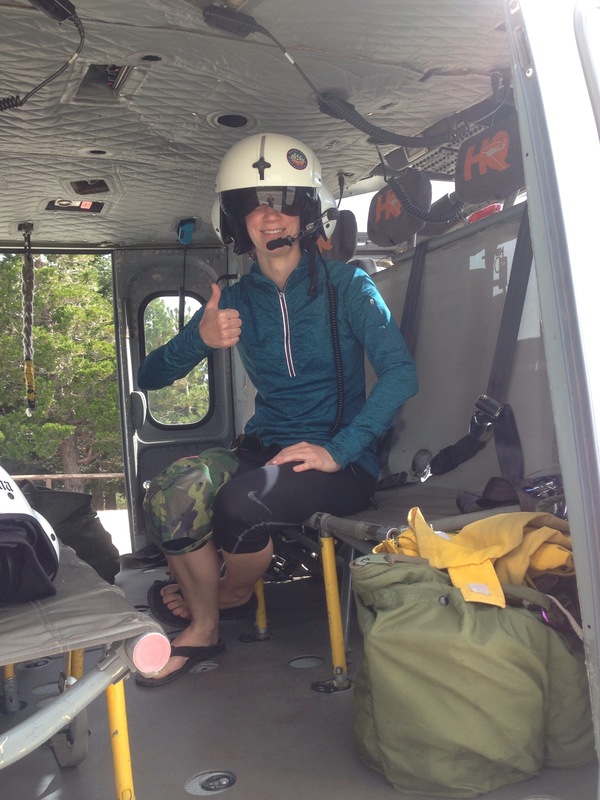 As we talked about what they did, I was allowed to climb in the helo & try on a helmet. I was like a kid in a candy shop – smiling from ear to ear! I enjoyed touring the base and learning about the job. I very much appreciate that they stand ready to combat California’s wildfires and, during their downtime, will entertain visitors like me. 😊 This was, hands down, my favorite part of the day. On their recommendation, Charlie & I headed back down the road and stopped at the Heaps Peak Arboretum. This was a pleasant, wooded trail offering peace and tranquility, though not much solitude. A popular location for travelers and locals alike. I met a couple that had been enjoying the trail for 49 years. They spoke of the ways the trail has grown and changed, as well as memories of taking their kids there over the years. In a way, I felt like it was their trail and I was honored they shared it with us. I decided to spend the night on the northern side of Big Bear Lake, at Hanna Flat Campground. We arrived just before dark. I quickly set up the tent with whatever sunlight remained and my trusty lantern & headlamp. There was a host on duty that was supposed to come by and collect our fees for the night. I never saw them. I guess not every campground host is as friendly, hospitable, and on-the-ball as the hosts at my previous two campgrounds. Charlie fought me on the tent tonight. He absolutely dug his heels in and said “no way!” I’m not sure why he protested; he didn’t have any problem last night. Hopefully this is a one-and-done kind of stubbornness. *For the record, he is now in the tent and fell asleep as soon as his head hit the doggy bed again. Silly pup. What an awesome adventure – you made my friday with this post… Really want to visit now… I felt that chill when you described it in the opening paragraph. Great piece and great adventure.. Thank you so much for your kind words! I highly recommend visiting, if you get the chance…you won’t regret it. 😊 And, if you’re a camper, pick Pine Knot over Hanna Flat. I like to camp – I have camped in the states before and all around africa – but my wife is not a fan…! You can find out why on my blog if your interested – camping in Africa takes a lot out of you… ha! Having a serious wanderlust now though – lovely writing! 03.11.16//A Penny for your thoughts?